CHICAGO (Reuters) - Wal-Mart Stores Inc said on Thursday it introduced a new system of scheduling working hours in July across its hypermarkets in China, and a majority of its employees support it. Wal-Mart's remarks came in response to reports of unofficial strikes by its employees in China. 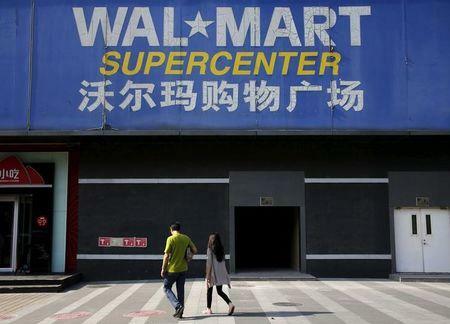 "We have communicated the new system to Walmart China associates and the majority of associates support it," spokeswoman Jo Newbould Warner told Reuters. She said the system, which is unique to China, gives workers the flexibility to work additional shifts if they want to. The Financial Times on Thursday reported that Wal-Mart's China workers had launched a series of strikes in some stores in Nanchang, Chengdu and Harbin against the new system. Some workers demanded that Wal-Mart scrap a scheduling system that allows managers to flexibly schedule an unlimited number of hours per day, with no overtime pay. The report, which did not give details about the nature of the strikes, quoted a Wal-Mart employee in Nanchang saying that workers will continue the strike until they receive a satisfactory response from the company. The Wal-Mart China employees also expressed solidarity with workers in the United States and their struggle for a $15 minimum wage, known as the “Fight for Fifteen” movement. The report said the strikes were rapidly organized using the mobile messaging platform WeChat, with workers creating a group which has now reached 20,000 members, a fifth of the workforce of Wal-Mart China.